A couple days ago my wife was reading CNN in the morning when she came across an article on a peanut butter recall, we both read the article and seeing how she is thinking about starting her own parenting blog I even mentioned to her that breaking news articles like that could fill some of her content on her blog. I sort of smiled to myself throughout the day as I ran across blog articles like this here, here, here, and probably about 5 other blogs. 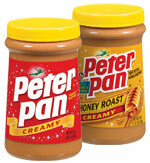 Well about 3-4 days go by and I’m about to leave work yesterday and my wife IMs me and says “My goodness MFJ do you realize you’ve been eating the bad peanut butter!” Sure enough even though we never purchaase Peter Pan, for whatever reason last time we went shopping we picked up Peter Pan crunchy peanut butter and sure enough the product number starts out with 2111.Also turns out that I spent most of last night praying at the porcelain alter, although I doubt it is because I was eating tainted peanut butter as the stomach flu has been going around my family. Needless to say this is a prime example of even if you know what you should be doing, if you don’t go ahead and use the information you have to your benefit it does you no good. You can spend all day reading personal finance blogs like this, but unless you actually act on the information you have gleemed from your research you aren’t doing yourself any favors. So take this peanut butter snafu of mine to motivate yourself to start saving for retirement now, boost your 401k deferral percentage, buy disability/life insurance, finish your will, or whatever other items you have been putting off even though you know what you should be doing and just need a kick in the pants to act on that information.